Just a quick idea I wanted to share. Today I picked up a super cute 2013 planner (actually, it runs from September 2012 through December 2013) at Michaels for just $2.80. 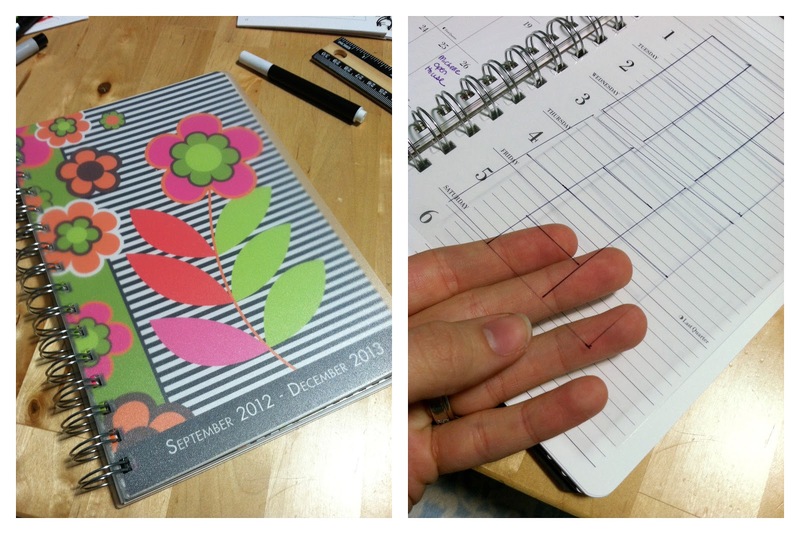 It has a page per week with space for each day (perfect for my daily to dos and appointment notes) and monthly pages. Instead of making my own planner like I was going to, since this had EXACTLY the layout I wanted, I decided to make a transparency with the Project Life Design A template that I could slip into the planner each week. I just used my Bind-It-All to punch the holes (they're the same spacing as the planner), and snipped a little slit on each one so that I could snap the transparency into the planner in the week I was on. I can move it to the next week after a week is done. Just use a dry-erase marker so that the notes can be erased and wiped clean for the next week. I used a Sharpie to draw the template on so it was permanent. I don't have printable transparencies for my ink jet printer, so this worked best for me.